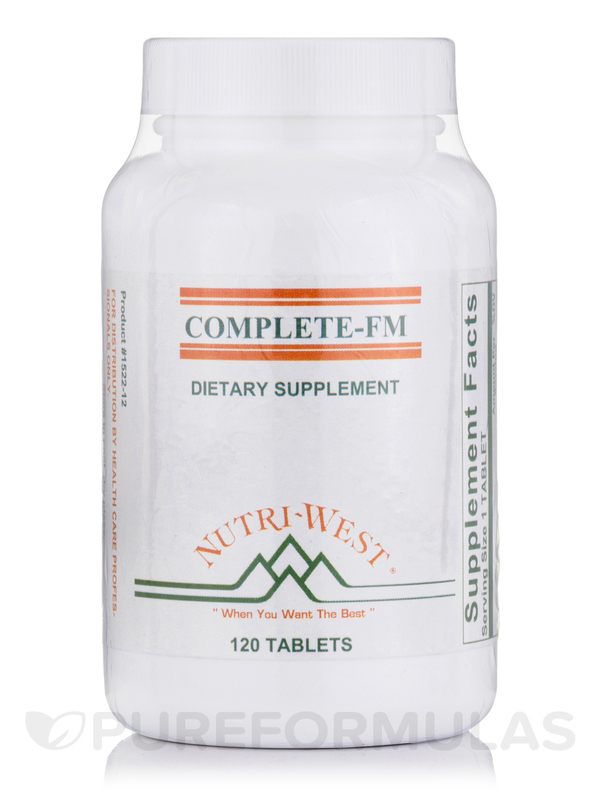 Complete-FM from Nutri West is a dietary supplement designed to possibly provide nutritional support for your joints and muscles. When you review the ingredients of Complete F-M the first thing you may notice is that it provides 3 essential minerals: calcium‚ magnesium‚ and zinc. Calcium is well known for being essential to bone health. But not everyone realizes it plays a crucial role in muscle function as well. Healthy calcium levels are integral for muscle contractions of all kinds. As for magnesium‚ deficiencies of this essential mineral often coincide with muscle weakness as well as muscle cramps. Additionally‚ studies and research suggests that zinc may help with muscle growth. Complete F-M also features a mixture of amylase and lipase. These two substances are enzymes‚ chemicals which help speed up chemical transformations in the body. Amylase is found in the saliva of our mouths. It's responsible for beginning the process of turning starches into sugar for digestion. Lipase on the other hand catalyzes the break down on lipids (fats). The reason these may help muscles and joints is because they may potentially help with absorption of nutrients. This may help our bodies have everything they need for healthy the growth and function of joints and muscles. 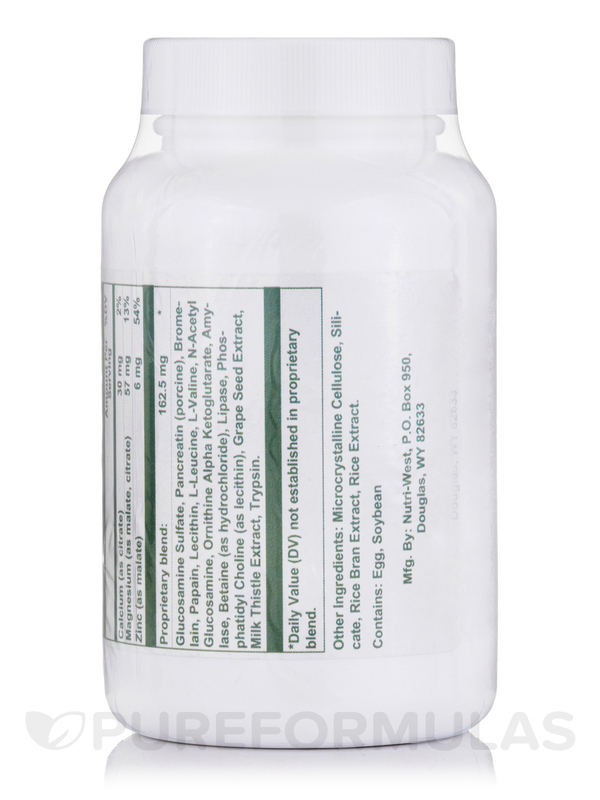 To support joint health‚ Complete F-M is also formulated with Glucosamine Sulfate. This chemical is used by our bodies in the production of ligaments‚ cartilage‚ and a type of fluid that encompasses out joints. There are only a handful of the many ingredients formulated into Complete F-M. Talk with your healthcare practitioner to see if Complete F-M is right for your and your health needs. 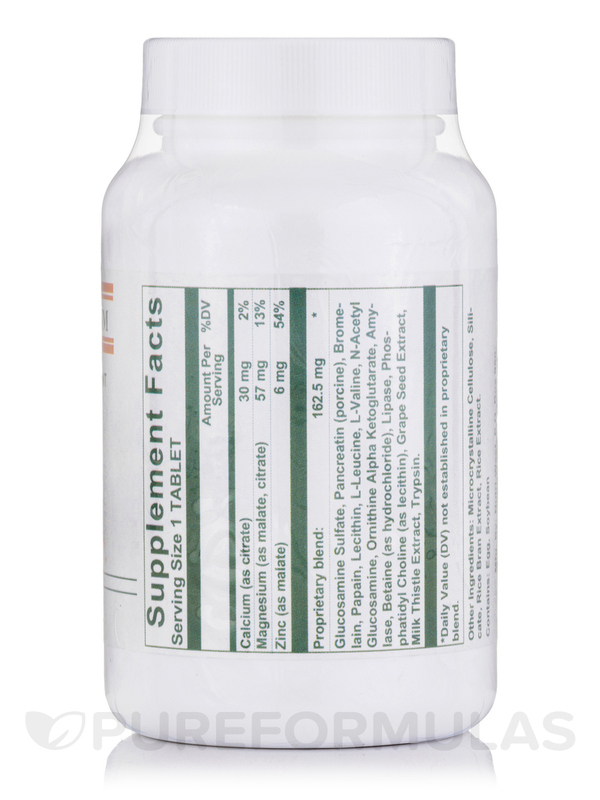 **Malic Acid 588 mg‚ Grapeseed Extract 8 mg‚ Betaine HCL 13 mg‚ Silymarin Extract (20% Silybin) 8 mg‚ Bromelian 24 mg‚ Papain 24 mg‚ Trypsin (chymotrypsin) 4 mg‚ Lipase 12 mg‚ Amylase 16 mg‚ Pancreatin 6X 44 mg‚ Lecithin (Phosphytidal Choline 12 mg) (CONTAINS EGG/SOYBEAN) 26 mg‚ L-Leucine 22 mg‚ L-Valine 22 mg‚ Glucosamine Sulfate (CONTAINS SHELLFISH) 50 mg‚ N-Acetyl Glucosamine 20 mg‚ Ornithine Alpha Ketoglutarate 20 mg.
*%DV is the Percent of the United States Daily Value. **%DV has not been established. Other Ingredients: Microcrystalline Cellulose‚ Vegetable Stearine‚ Magnesium Stearate‚ Stearic Acid. Contains no starch‚ salt‚ sugar‚ wheat‚ corn‚ yeast‚ milk‚ gluten‚ preservatives. 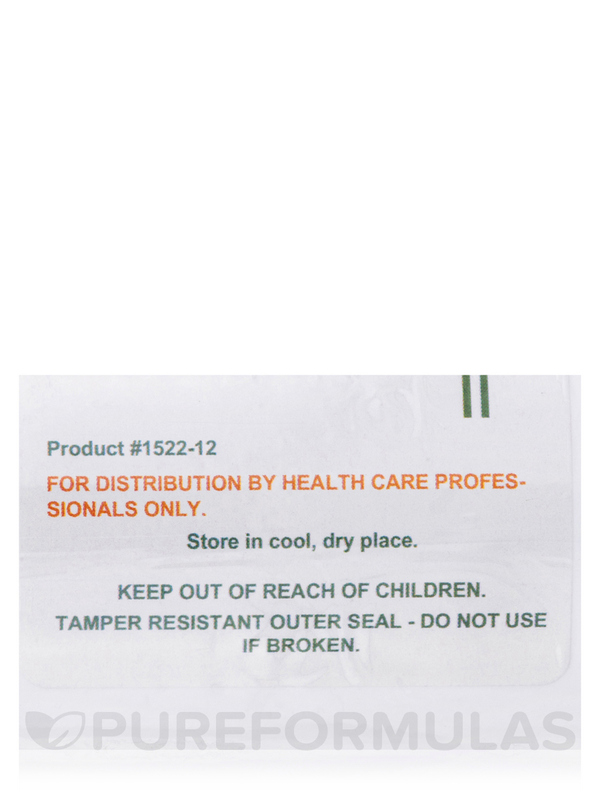 Manufactured under strict GMP and USP guidelines. 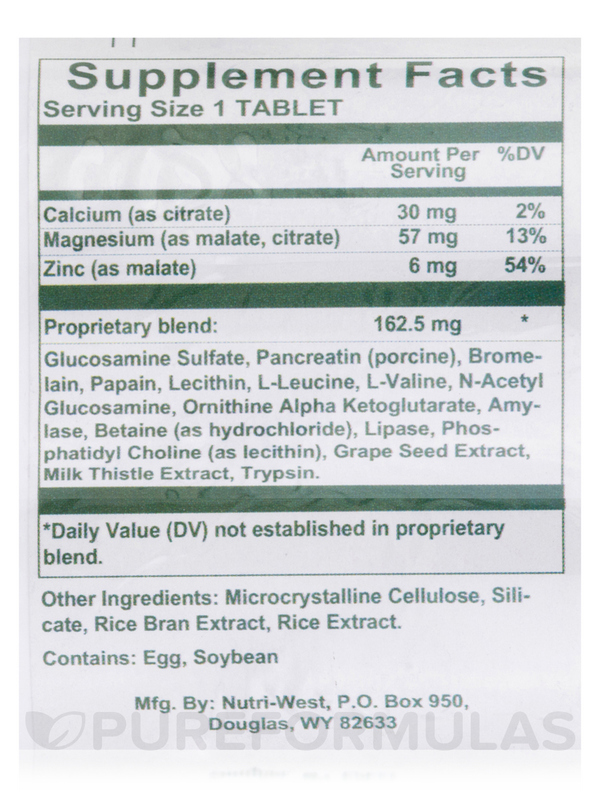 2 tablets 3 times daily or as directed. Complete F-M keeps pain away so you can move as you would like. Hard to swallow so use lots of water. I have taken vitamins all my adult life and can literally swallow a hand full at a time but the size and jagged edges of these pills shred my throat. That being said I have forced myself to use them and they have greatly reduced my fibromyalgia pain. 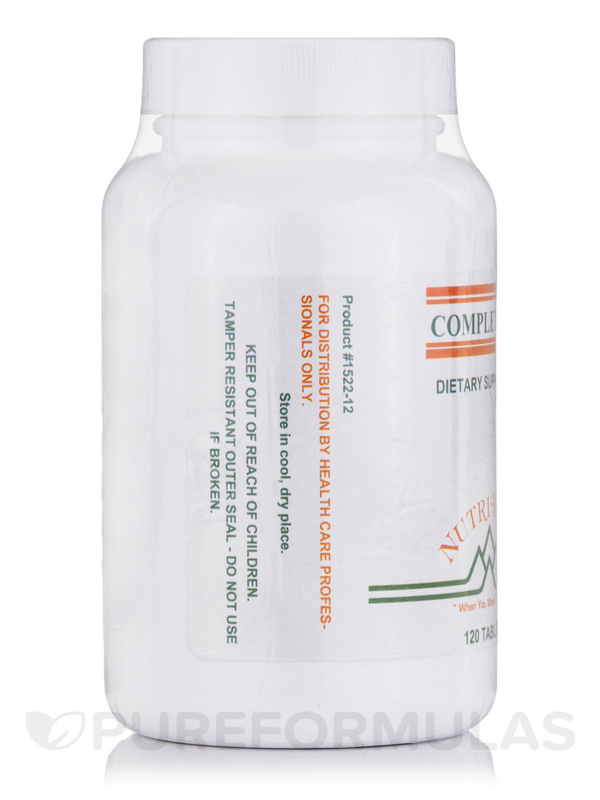 I have stopped taking Complete-FM by Nutri West a couple of times because of the swallowing issue but noticed an increase in pain levels both times. Really helps reduce fibromyalgia pain. The edges of the pills along with the shape shreds your throat.